Learn everything about the St. Emilion Satellite Appellations with a history of the Saint Emilion Satellite Appellations, look at the style, character of the wines, wine tasting notes and detailed profiles for al the bet wines, vineyards and producers, with wine tasting notes, histories, wine and food pairing tips and wine buying guides. The Saint Emilion Satellite Adjacent communes located just to the north and slightly easterly direction of St. Emilion. The St. Emilion Satellite region features numerous, quality producers that consistently make well priced, Merlot dominated, Bordeaux wine that is quite affordable and stylish. The terroir can be similar to Saint Emilion with its limestone, clay and gravel soils. However, the St. Emilion satellite appellations are usually cooler than what you find in St. Emilion and as the region is further from the Dordogne, it has a different climate as well, requiring later harvesting dates. The various St. Emilion satellite appellations do have old vines. In fact, some of the oldest vines in the various regions are over 100 years old! Merlot is the dominant grape. Cabernet Franc is next in line and other Bordeaux varieties planted in the Right Bank can be found in the vineyards as well with plantings of Cabernet Sauvignon, Malbec and Petit Verdot. There are four communes in the St. Emilion Satellite appellations that are allowed to add the term “St. Emilion” to their appellation name. Previously, 6 communes held that right. But two regions merged with other existing communes, so they no longer exist. The two areas that no longer remain are: Parsac St. Emilion, which became part of Montagne St. Emilion at some point in the 1970’s and Sables St. Emilion, which was officially annexed into Saint Emilion. The most well known estate from Sables St. Emilion was owned by Dr. Alain Raynaud, Chateau Quinault L’Enclos. The four Saint Emilion satellite appellations are: Lussac St. Emilion, Montagne St. Emilion, Puisseguin St. Emilion and St. Georges St. Emilion. Some of the top Bordeaux value wines come from those appellations. When added together, the satellite appellations of St. Emilion cover a large area with 5,485 hectares planted with vines. As you will discover, many of these area have ancient histories as they were some of the first areas the ancient Romans used to cultivate vines. However, the creation of the hyphenated term is still sort of new. Prior to 1921, the growers in those regions were selling their wine as being from St. Emilion. In 1921, a court ordered firm boundaries set, which in turn created the various satellite appellations. In a heated court battle, the best the chateau owners were able to do was to get the court to allow them to add St. Emilion to the beginning of their hyphenated appellation name. Clearly today, the Saint Emilion satellite appellations are considered separate from St. Emilion. However, with time, producers in St. Emilion has given them a warmer embrace. The Jurade of St. Emilion is considering allowing chateau from the areas to become members. 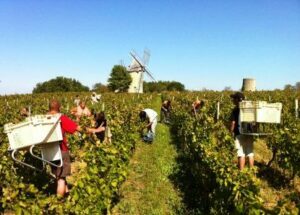 The cooperative of St. Emilion, “The Union of Producers of Saint Emilion also known as the UDPSE is seeking a way to merge with the cooperative of the Saint Emilion satellite growers. The best vintages of the St. Emilion Satellite appellations are: 2016, 2015, 2014, 2012, 2010, 2009, 2005, 2001 and 2000. Older vintages should have already been consumed. Puisseguin St. Emilion, located due north of Saint Emilion, is the eastern-most commune in the St. Emilion satellite appellations. Puisseguin is 989 hectares, with 731 hectares under vine. On average, close to 375,000 cases of wine are produced each year in Puisseguin Saint Emilion. The region was granted appellation status in 1936. The appellation takes parts of its name from Puy, which is an old Celtic term that means “The hill of the powerful wine.” The second part of its name comes from Seguin, who was an officer that served under the Emperor Charlemagne. Put those two terms together and you have Puisseguin. There is quite a bit of history in the area as Roman ruins can be spotted in the region. Close to 75 chateaux produce wine from Puisseguin St. Emilion. The terroir is limestone, clay, gravel and sandstone soils. Merlot is the most widely planted grape variety and is most often blended with Cabernet Franc. You can also find small amounts of Cabernet Sauvignon and Malbec planted as well. Almost 100 growers are active in the Puisseguin St. Emilion appellation. Several new properties have recently sprung up, making the region a hot bed of activity for quality minded producers. For the best wines from Puisseguin St. Emilion, look for Chateau Soleil, Chateau Clarisse and Croix de Justice. Lussac St. Emilion has 1,396 hectares under vine. Lussac takes its name from its ancient Roman roots. The name comes from the ruins of an ancient Roman villa, which which was named for the Roman Luccius, who was known for first cultivating the region. The estate of Luccius was vast, encompassing most of the what we know of as the charming, local village today. Lussac St. Emilion is situated in the most northern section of the St. Emilion satellite appellations, placing it north of St. Emilion and just west of the Cotes de Francs appellation on one side with Montagne St. Emilion to the south. In fact, Lussac and Montagne Saint Emilion are only separated by a small stream, the Lavie. Today, close to 215 growers are active in the region. However some of the growers still sell their harvest to local cooperatives. On average, close to 825,000 cases of wine are produced in Lussac Saint Emilion each vintage. At one point in time, the entire appellation was devoted to producing wine for religious purposes. Lussac St. Emilion has a complex set of terroirs and soils, which range from limestone and clay soils on the slopes, clay and gravel in the valley and sand with clay soils on the plateau. There are some vineyards that are planted on soils that are almost pure clay. The best terroirs seem to be located to the north of the Lussac St. Emilion appellation. Merlot is the dominant grape, followed by Cabernet Franc. For the best wines from Lussac St. Emilion, look for La Grande Clotte, La Croix de Peyrolie, Soleil Le Rival and Du Courlat. Montagne St. Emilion has 1,549 hectares under vine. Montagne is the largest of all the St. Emilion Satellite appellations with close to 220 growers in the region. Close to 10% of those growers provide grapes for the local cooperative. On average, there are approximately 775,000 cases of wine produced in Montagne Saint Emilion each year. The appellation of Montagne St. Emilion, which is located just south of Lussac St. Emilion, and less than 5km from the St. Emilion village takes its name from the translation of Montagne. Montagne can be translated into mountain. The Montagne St. Emilion commune enjoys a terroir that is made up of a series of rolling hills and clay with limestone on the slopes for its soils. The plateau consists of limestone, gravel and sand in the soil. Merlot is the dominant grape in the Montagne Saint Emilion appellation followed by Cabernet Franc. Growers also plant lesser amounts of Cabernet Sauvignon, Malbec and Petit Verdot. The terroir here can be compared to Saint Emilion, in fact the region is only separated from St. Emilion by a small river. Some of the best wines produced in the St. Emilion satellite appellations come from Montagne St. Emilion. For the best wines in Montagne St. Emilion, look for Beausejour Montagne, Faizeau and Vieux Chateau Palon. St. Georges St. Emilion is the smallest of the St. Emilion satellite appellations with just 180 hectares under vine. In fact, it’s one of the smallest of all the 60 different Bordeaux appellations. On average, Saint Georges Saint Emilion produces about 83,000 cases of wine each year. As you might expect, Merlot is the most important grape, followed by Cabernet Franc. In the vineyards, there are also much smaller plantings of Cabernet Sauvignon and Malbec. Interestingly, at its peak of 89 meters, it enjoys one of the best elevations in the Right Bank. St. Georges is also one of the oldest wine producing areas in France. The region was granted appellation status in 1936. The Romans were the first people to cultivate vines in the area. Ancient ruins can be found in the area. The formation of vineyards in the area led to the building of a massive fortress and villas. A spectacular medieval castle was also built in the appellation. In 1843, a stunning Roman villa was unearthed in the area with its colorful mosaics and frescos still intact! The museum of Aquitaine has some of the statues on display that were discovered in those excavations. The discovery of those Roman ruins inspired the name of the Saint Georges appellation. Today, less than 20 different producers are currently making wine from the region. Located just north of the Saint Emilion village, next to Montagne, and just to the right bank of the Barbanne stream, many of the vineyards in the St. Georges St. Emilion appellation enjoy elevations and slopes similar to what can be found St. Emilion. The terroir is clay, chalk and limestone soils. Interestingly, Chateaux in Saint Georges St. Emilion have the option of selling their wine in two different appellations as AOC law allows them to state that their wine can come from either St. Georges St. Emilion or Montagne St. Emilion. For the best wines from St. Georges, Saint Emilion, look for Cap Saint George, Tour du Pas St. Georges and Chateau Saint Georges.